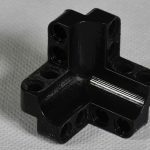 3D LEGO Technic Connector | Christoph Bartneck, Ph.D. 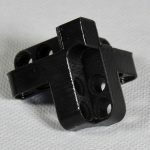 Connecting LEGO Technic beams in three dimensions remains a difficult task. 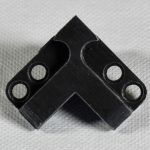 While it has become easy to connect beams in one and two dimensions, it remains difficult to extend this to the third dimension. 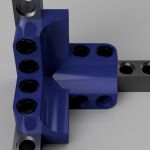 I first designed a new LEGO Technic connector that features pins. The design was compact and stable, put the pins were too fragile. It was also very difficult to get the support material out from the holes. 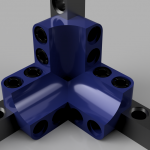 My second design had no pins but still the option to firmly hold a technic beam. 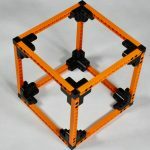 With this new 3D printed corner part it is possible to build a perfectly stable cube with a minimum of parts. 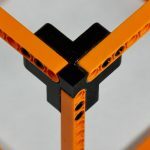 The additional holes provide options for further strengthening the cube or to connect other parts to the cube. 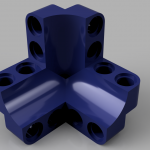 The CAD model is available from Autodesk and GrabCAD.